My Opinion: 6.9 || Sumptuous, sensual movie with brilliant use of visuals and ambient sounds. More a sensory experience than a piece of storytelling, though, as the plot and characterizations are disappointingly thin. Notwithstanding those shortcomings, it’s a sensory delight and well worth the time. SYNOPSIS (Courtesy of IMDb): Little things mean a lot in the world of 10-year-old Mui, a girl who’s trained to be a house servant in 1950s Vietnam. This film follows Mui as she grows up in pre-war Saigon, and finds quiet love with a family friend. Dialogue seems almost tertiary in this film that celebrates the senses, as the young girl discovers the world around her and marvels at every new sight, sound and scent she experiences while going about her workday life. Strengths: The photography is lush and precise, with exquisite attention to small textures and details. Almost as important are the lovely ambient sounds — water dripping, leaves tapping, oil sizzling, and so on. Music plays a prominent part, but it’s always ambient as well, played by the characters and integral to the environment. It’s a quietly observant film that communicates tiny moments with beautiful fidelity. Weaknesses: Hung sets up a promising plot and introduces characters who are sketched with a light but interesting touch — and then lets much of it go. The first half of the film has several interesting elements and characters, but then we take a sudden jump forward in time, and Hung makes only a desultory stab at continuity. The real problem, though, is that the second part lacks any real drama or interest aside from the consistently lovely visuals. Hung makes no attempt to define his characters or provide any authentic tension. The second storyline concerns a vapid and ethically questionable romance that seems more a platform for beautiful cinematography than meaningful storytelling. And although it’s rather nice to watch a movie about mid-20th Century Vietnam that isn’t about the Vietnam War, it’s odd to provide such a complacent ending, with no hint that this world of comfort and luxury is approaching its collapse. 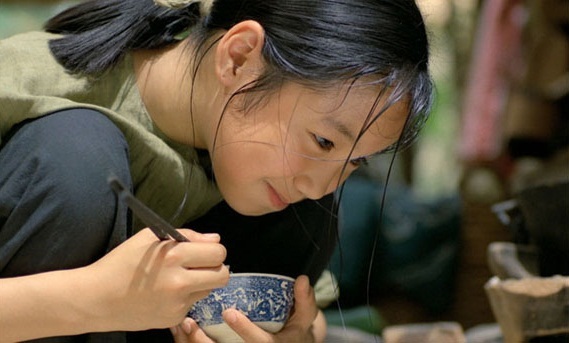 Characters/Performances: Man San Lu, who plays Mui at age 10 is captivating and conveys a great deal with few words. Her character at 20 is played by Trân Nu Yên-Khê, who’s expressive and beautiful but less fun to watch. Similarly, it’s a shame to leave behind the interesting characters of the film’s first half for the flat characters of the second.